The problem with the #StClairDisaster debate, so-called, is that the extreme rhetorical polarization whipped up by the brothers Ford precludes any rational discussion about how to make practical improvements where they are warranted. The Fords couldn’t give a damn about St. Clair — their target audience mainly lives elsewhere. But you’d think that Cesar Palacio, the local councillor, would realize his incessant carping about the alleged carnage on St. Clair is inflicting all sorts of brand harm on the retailers he purports to support. After all, he’s spent years telling their prospective customers to steer clear. At some point, it becomes a self-fulfilling prophecy (in case the Corso Italia BIA is still looking for someone to blame). As for local drivers, Palacio and the dwindling collection of Ford allies have been conspicuously silent about how the city might make some targeted fixes to improve bottlenecks, especially on the western stretches of St. Clair. Again, the question begs: why isn’t Palacio trying to mitigate his constituents’ driving problems instead of whining ceaselessly? After all, the right-of-way ain’t going anywhere. From what I’ve heard and observed, there are a handful of hot-spots that raise everyone’s temperature: the bottlenecks under the railway bridge near Keele, the westbound turn lanes east of Oakwood, and on the east-bound lanes between Vaughan and Bathurst. It’s also clear that parked cars pose a particular sort of impediment when they’re left on those stretches adjacent to the streetcar stops. 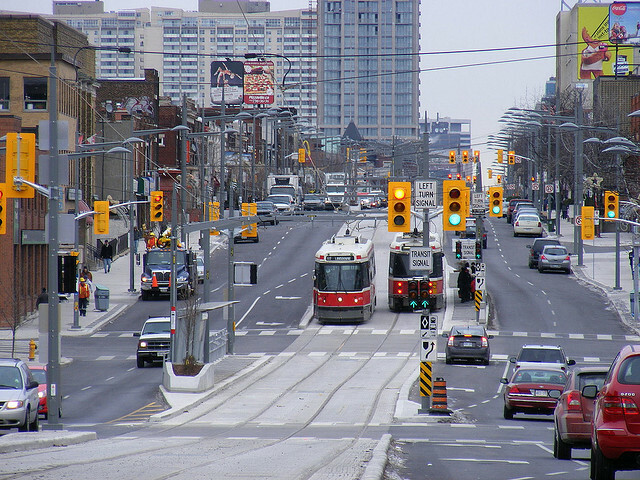 • Impose a 24/7 ban on stopping and parking in the areas directly adjacent to streetcar stops. Those are the locations where turning buses or trucks sometimes get stuck, and where drivers are heading after making a U-turn. They also represent the zones where EMS vehicles may encounter an absolute blockage. Clear them out. • Begin the process of developing a plan to widen St. Clair under the railway overpass east of Keele from one driving lane to two, as is the case everywhere else on this road. The City’s decision to allow the ROW to go through this bottleneck without making provisions to expand the underpass was a mistake and needs to be fixed. Joe Pantalone, lest we forget, lobbied for years to get the City to allocate capital funds to sort out the Dufferin Street jog ($40 million); this location should receive similarly close attention from a planning, engineering and budgeting perspective. • Undertake traffic modeling studies to determine how best to address the back-ups at Oakwood (westbound) and Bathurst (eastbound). In both spots, it’s obvious that the bottlenecks are symptomatic of closely-spaced signalized intersections coupled with overly tolerant street-parking rules. In both locations, there’s plenty of nearby parking, on side streets or in parking lots. Yes, it’s great to be able to stop your car in front of the Shoppers Drug Mart at St. Clair and Bathurst. But it won’t kill anyone to park around the corner. In the case of Oakwood, the City should acknowledge that the right-turn from St. Clair to Oakwood is part of the feeder route up to the Allen and the 401. What’s more, drivers have long been funnelled towards that intersection because of the traffic maze south of the Allen, so it is reasonable for them to expect that it works properly. Joe Mihevc in the past year or so pushed the City to add a turn lane onto the Allen from Eglinton West, thus easing a backlog that stretched all the way over to Bathurst. Palacio should press the City to ban parking on the north side of the block east of Oakwood. On balance, it is more important to allow that intersection to function smoothly than to allow cars to stop in front of the dry cleaner. And if the merchants yelp about the loss of parking spots, as they invariably will? The City is well within its means to help them out by working with the local BIAs to provide customers with information about Green P lots or even set up a system that allows merchants to provide their customers with discounts on their parking fees, as is done in some downtown towers. After all, the city allocates funds for façade restoration in the name of local economic development. Why can’t those budgets be used to give a bit of a break to customers who drive to the area to shop? There’s no reason I can see why these bottlenecks on St. Clair can’t be loosened up sufficiently to improve the driving experience. Which, it should be said, is the right thing to do. After all, the City shouldn’t be in the business of making life unnecessarily difficult for any resident, regardless of their mode of travel. None of this will happen, however, until Palacio chooses to move beyond the obstructionist politics that continues to mar his approach to the main arterial running through his ward. And until he does, his name rightfully belongs on the list of those waging, ahem, a War On The Car. God Toronto is an ugly city. I know the photo uses an unusual lens and was shot in winter, but it really highlights the blah. If that photo were taken in any other city’s version of St. Clair the poles and signals would be in black, the ROW would be textured in red faux-pavers, and there would be twice as many plantings/trees. Toronto – the land of dull gray, garish yellow and concrete. The streetcar route, though, is awesome. So at least there is that. But yes, work to smooth operations and put the darn thing on a map! One thing to keep in mind is that there have always been back-ups eastbound at Bathurst. As far as I can tell, it’s not really any worse today that it was ten years ago. Like many other main intersections in the city, it gets congested, and parking is definately one of the main reasons for this. A good example is Danforth Ave through Greektown: it has no public transit running on the surface, yet traffic crawls most of the time because parking takes up two of the four lanes. It’s no different on some parts of St Clair (not just now, but even before the ROW), yet certain people insist on blaming the streetcar line. However, we shouldn’t ban or even reduce on-street parking in my opinion. If you’re looking for wide open, fast moving streets, I say move to Oshawa or Markham or MIssissauga. Busy, traffic filled streets are a fact of life in a large city, and if driving through them bothers you, I suggest hopping on the streetcar instead. It’s a very pleasant ride. Constructive suggestions. The railway bridge over St. Clair between Keele and Old Weston was obvious as a bottleneck even before the right-of-way. Metrolinx (or its predecessor entity – not sure) wasn’t willing to rebuild the overpass as part of the extensive work on the Georgetown corridor and AirRail Link, but I don’t know how forcefully the city even asked. The city has since allowed townhouses to be built very close to the north side. given my preference for subways I think St. Clair is beautiful and practical, this mayor is a disaster with no vision. He couldnt even develop a plan to finance a dinky 7 station extension. He even wanted to put a lrt underground. Its obvious he does not understand community, finance, or transit. Its obvious he’s desperate and lost. I think who ever is opposed to St. Clair has no appreciation of community or the urban fabric. Yes it was a construction mess but st. clair has now become a real avenue for generations. The new longer low floor multi door vehicles will stop bunching making it even better. Hope we get more st. clairs across the city, I just personally think eglinton/sheppard/drl should be reserved for exclusive rapid transit routes. Good article, John. Palacio and Ford should be lobbying Metrolinx hard to pay for widening of the railway underpass near Old Weston (can be done on the south side) instead of blubbering about how horrible St. Clair is. From the many comments I’ve seen online at various sites, residents of the area (not someone like @justthefacts) actually find the RoW construction hassles to have been well worth it. Rob Ford’s morning commute has him turning right off St. Clair onto Keele, right before the tremendous bottleneck caused by the railway bridge. It’s easy, and wrong, to assume the whole street is like that. As a cyclist, you can’t zone out while on St. Clair. Seriously, the only ones who can rightfully claim a “St. Clair disaster” are cyclists. The narrow driving lanes and parked cars make it nearly impossible to ride there. For commuting at least you can and should take Davenport, but reaching businesses on St. Clair on bicycles does not look like an attractive preposition. but really St. Clair is a good example urban revival. I live in Palacio’s ward and in the past, he has been fairly unhelpful on (non-St Clair-related) public transit issues. Our recently elected MP and MPP (both from the NDP) seem to have much more “presence” in the ward. Overall though I do agree with Lorinc’s ideas here. A change in the local parking rules would go a long way towards clearing the traffic backlogs both at Vaughan-Bathurst and at Winona-Alberta-Oakwood. I’m really not clear what any of those suggestions would accomplish, other than putting more cars onto St. Clair. With ridership on the line growing and more and more people living right along St. Clair, I’d bet the amount of customers who drive to get to stores probably make up only a small portion of all customers, which is getting smaller by the day. And that’s a good thing. The problem was that St. Clair tried to be everything to everyone. More parking was actually added to the streets post-construction to satisfy businesses and residents. Large curb cuts shrunk the sidewalks at intersections to give cars five lanes (one for turning, see the photo) at many intersections. And drivers were given priority at signals to make U-turns and left-turns before packed streetcars. Meanwhile, little was done for pedestrians and almost nothing was done for cyclists. If St. Clair needs improvement, these modes should get priority. Cycling isn’t really that bad on St. Clair, in rush hour there’s plenty of room for everyone with the parked cars out of the way and outside of rush hour traffic moves at a reasonable pace so no one’s flying by you the way they would on Avenue Rd. for example. The lanes being narrow, motorists tend to be very deferential and slow down to pass or wait till the road widens a bit. Like mentioned above, it’s really not that much different than Bloor or the Danforth. Ban and enforce street parking for a week and watch how traffic flows. Agreed on cyclists, but strenuously disagree re: pedestrians. The street is light years more pleasant to walk on now, largely because the boulevard breaks up the rush of traffic and allows for improvements such as corner patios. I didn’t buy the side-walk narrowing allegation when it was bruited during the fight and I still don’t. The sidewalks by and large are comparable to Bloor in the Annex. Also, politically, the bottlenecks are impediments to a broader consensus about the change on St.CW — witness the tenaciousness of this fight. I’ve heard nothing but great things about this neighborhood and have had several friends buy homes there recently. The neighborhood is now reaping the benefits of having decent public transit and will continue to do so. I feel pretty confident in predicting that Palacio will not implement or support a single one of your suggestions. Hopefully they will form part of a strategic platform for a more thoughtful person to replace him as councillor (although they might want to avoid talking about parking reductions. If Dundas West in ward 18 is any indication, BIAs will fight tooth and nail to preserve and expand street parking). Maybe turning on signal priority at smaller streets would be a good idea to improve the streetcar ride along the avenue. I can understand why they don’t want to turn it on at major roads, since it can mess up cross traffic flows, but at smaller side streets it can allow the tram to move quickly and competitively with cars between city blocks. Another thing worth considering is to give the line stop spacing comparable to Transit City lines, about every 500 metres or so. This would still provide more than adequate local coverage while still allowing the line to gain an excellent speed boost. Before you accuse the local councillor of being silent(Palacio), why don’t you do some research. Did you know that he supports the widening of St.Clair at Old Weston Rd? Did you know that the TTC will attend an April 16th, 2012 meeting to address all the concerns listed in your article? Don’t harp on about obstructionist politics when you won’t even give the local councillor a chance. PS: Did you know of this John? or did the obstructionist politics blind you as well? What will be interesting to watch is whether Palacio, the works committee and the budget committee are prepared to back the capital outlays needed to properly deal with that situation, or whether he’ll merely push to dismantle the right-of-way on that stretch. I live in Joey M’s ward on St. Clair and I think the Street car has been incredible at helping rebuild the neighborhood. Let Caesar criticize the ROW, JM has been pro ROW since the beginning and you can see what it has done to the shops along st. clair between bathurst and oakwood. New good restaurants that bring people from outside the neighboor hood, an abundance of new stores and a much higher quality of life in the area. Yes i agree with all those problems and they are easily fixable, and I think JM would probably help in eleviating them our district. Let Caesar scream and yell, it will bring all the good shops and restaunts to ward 22, and leave him with more empty storefronts, and then maybe they voters will clue in and kick out the bum. Palacio’s main opponent in the 2010 municipal election was Jonah Schein, who subsequently ran in the provincial election (and won) and is now the NDP MPP for Davenport. Then the City should expropriate all or part of the No Frills lot at the north end of Alberta Avenue and make it a (well publicised) Green P. The Bing overhead and Google Streetview seem to indicate quite a poor space utilisation. The No Frills is so ugly that from an overhead view, seeing tractor trailers making deliveries, I thought it was some decrepit factory clinging on to a historical enclave within this now largely residential/commercial neighbourhood. Maybe they’re just clinging on until a condo developer makes them the right offer. If we were really being ambitious an underground car park could be dug down under Oakwood Collegiate’s sports field – according to a note on the TPA’s website the school already allows TPA to run pay parking in their lot on the southeast corner of the property outside school hours. These are good suggestions. These are main problem locations that get brought up by neighbours when discussing the project. Bathurst/Vaughan is in Joe Mihevc’s ward so he may push it to be improved. I am hopeful that Oakwood could happen, but don’t have confidence in Palacio. I don’t have much faith in Old Weston to Old Stockyards every getting better. Two lanes under the railway bridge would help, but there is really only one lane going westbound throught Keele/Weston. The right lane is a popular right turn lane to Weston\Black Creek\400. The left turn to Keele is also well used. The newish housing on the NE corner means there is no way to widen the road or sidewalk. Plus that intersection is going to get worse once the development on the NW corner is completed. It was a horrible area to drive in before the right of way and it will remain so afterwards–especially on weekends when many more people around here drive. On my wish list for improving vehicle use I’d add put a drop off at the St Clair West entrance on the south side of St Clair. It’s a popular and dangerous drop off during rush hour which shrinks St Clair eastbound down to one lane. I’ve seen one rear ender and a few other close calls. There’s lots of room to put it in. The pedestrian traffic tends to stick to the north side where Loblaws is located so it should not be affected. To make it safer for pedestrians, I’d suggest banning 40 ft trucks along the whole stretch or St Clair that has ROW. I watched one make a turn off St Clair to Dufferin this week! Yikes! He almost took out a bunch of people waiting to cross the road. I’ve seen more than one 40 ft truck have to back up and to negotiate a turn on or off St Clair blocking cars, streetcars and pedestrians alike. Nice thought but would be instantly seized on by the anti-LRT faction such that LRT is anti-business. I’d at least hold off until some surface LRT is built so people can see the difference. Also, a 40ft ban without some sort of mitigation might impede efforts to extend west of Gunns Loop in a post-Palacio era. A contributing factor to the problem of traffic being rammed through St Clair at Keele is that the CN/CP corridor severs this area with no crossings between Rogers Road and St Clair, compounded by the similar violence the Metrolinx Barrie line does to the street grid a bit further east. This means even local traffic must squeeze through either of these roads. Unfortunately, previous Councils have failed to plan ahead because even if another connecting street could be pushed under the line the entire west side of the line/east side of Weston Road is lined with factories (contributing to a fairly dire view from a passing VIA train I can attest) and the east side seems to be largely a wrecking yard west of Union Street. It’s possible that post Eglinton LRT that latter land will become even more valuable and thus rezoning to residential applied for (similar to the Brickworks Lane townhouse development crammed against the line on the other side) but this will only further stress an already compromised road network. St. Clair’s street design is a disaster. I have as little respect for the mayor as any moderately intelligent person has, but he actually was right about St. Clair being flawed, even though he was wrong about describing the system an LRT, but hey.. If we could compare the number of ‘stop-lights’ on College Street and on St. Clair between Bathurst and Dufferin, for example, there are far too many useless stoplights on St. Clair. These numerous closely-spaced signalized intersections are always too frequently stopped Red for far too many minutes, holding up traffic while virtually nothing crosses the intersections. As a result, we see traffic jams on St. Clair in daytime off-peak hours. This would only make sense if the intention of the design was stagnation. Okay, enough griping from me, here’s my modest proposal: the signalized intersections are not going away, we now have accepted them as permanent street features… But for example, take the Arlington/St.Clair intersection: going along St. Clair it almost always seems to be stopped Red half of the time; why should it? Why not make it Red for 20 seconds every seven minutes or so? In my experience the back-up at Winona / Alberta / Oakwood (three lights right next to each other) is worse than at Arlington. Hmm. With the GO Transit lines to be sunk south of St. Clair, perhaps the right thing to do is actually to sink them under St. Clair too. This would be very disruptive during construction, but would allow for a reconfigured “surface level” St. Clair with greater width, less of a rollercoaster ride for the trains, and room to lid over the tracks and build on top of them in the distant future.